Thanks to the self-imposed period of nonline time, i didn’t get a chance to rave about a great show that’s on at the moment at MOP. Good friends Damian Dillon and Philip Wilson are in a group show in the main room with a mate of theirs, Mike Roddy and Canberra artist Kirsten Farrell is in the Project room with her Green work. I really liked Kirsten’s work. 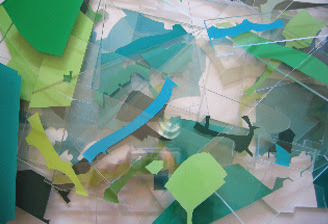 As someone who understands the colour-based affinity, i was into the green coloured resin offcuts of some industrial process. Varying tones and hues of green, collated to create some kind of planar journey through the colour, they were quite funky pieces. Although the cheeky part of me wanted to grab a whole bunch of my own red offcuts and set them off together – get them really flashing! Mike’s paintings were reminiscent of early Gerhardt Richter photorealist paintings (before he discovered what slathering great wads of paint over picturesque landscapes felt like) and were very pretty, but not something i really wanted to engage with. Philip had two types of photographs in the show, both taken on his trip to Japan last year, or the year before – i can’t remember. 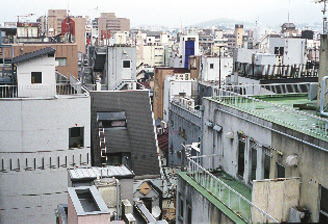 The large uban works (like the image below) were reminiscent of other works of his I have seen and while they’re technically and aesthetically good, i preferred the intimacy of the smaller Naka/Soto works, which document areas where the outside world (especially nature) infiltrates interior worlds, and vice-versa. Damian Dillon is starting to experiment with new subject matter in a new format, but in this exhibition is still working with his trademark (and super more-ish) large photographs of especially industrial settings, [specifically airports this time] and then altering them in very analogue ways – with collage, fucked up exposures, tape, scribbles on the screens and references to old school proofing marks. His focus has always been on obscuring and revelation using analogue and is still keepin’ it old school, working with large-format cameras, film and playing around with the boundaries of that technology. My favourite work in this show is the work in which these huge jumbos and the accompanying equipment end up looking like kids models. It reminded me of something Fischli/Weiss would have done about 15 years ago and was achieved through extending the hell out of the bellows of a large format out over a fence, completely obscuring his view – hoping to hell it all worked out. This look was possibly passé in the mid 90s when everyone was DIY-ing it up, but now that retouched cleanliness and brightness of production is so accessible and du jour, Damian’s work is the equivalent of my old scratched 7″ of California Über Alles. Sure, it may be nostalgic, but it’s also so goddamn raw and still looks hard and fast at what the world has to offer that it reminds you that humanity doesn’t always fall into the 25 colours of the Revlon Foundation spectrum. 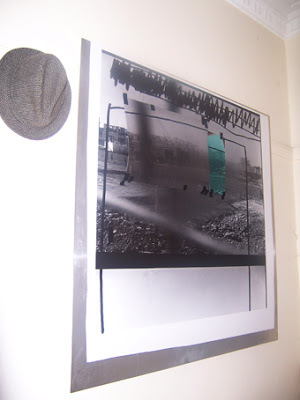 Not work from the current show, but a Damian Dillon nonetheless – in my hallway! gloating? Not much!!! I’d like to be able to say ‘even if i didn’t know these artists, it’s a great show’, but seeing as i do know them, there is no possible way that i can be objective. But since when has that stopped me! This show is a top show and a great start to the MOP year. Go and check it.